I love the crisp and clean simplicity of white on this piece from Mary at Orphans With MakeUp! 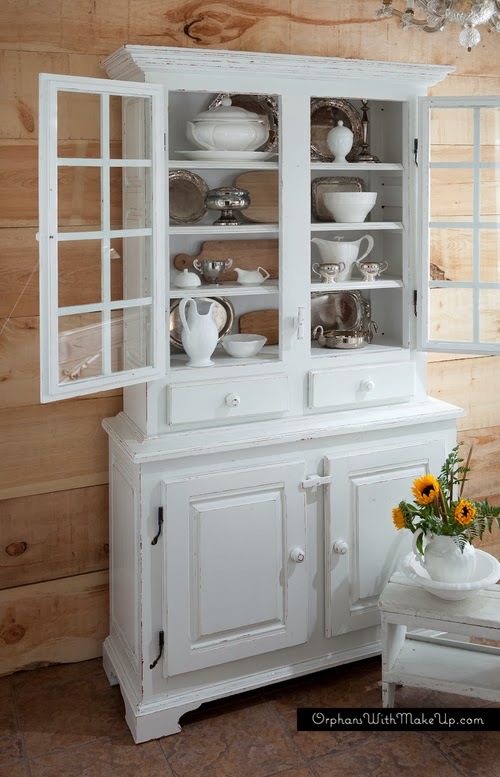 My next project is a china cabinet and it's going bright white too! 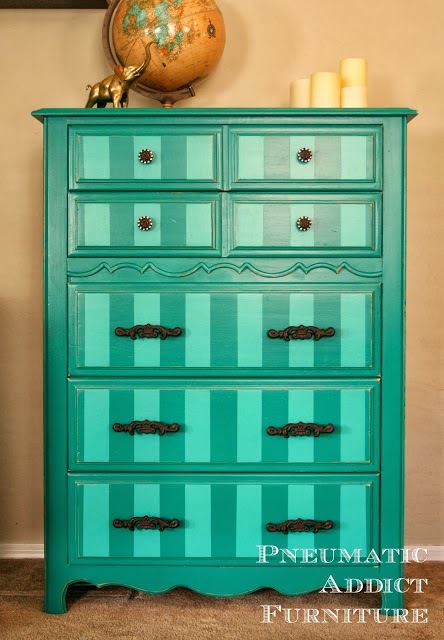 Elisha from Pneumatic Furniture Addict went really bold with this striped teal chest of drawers! 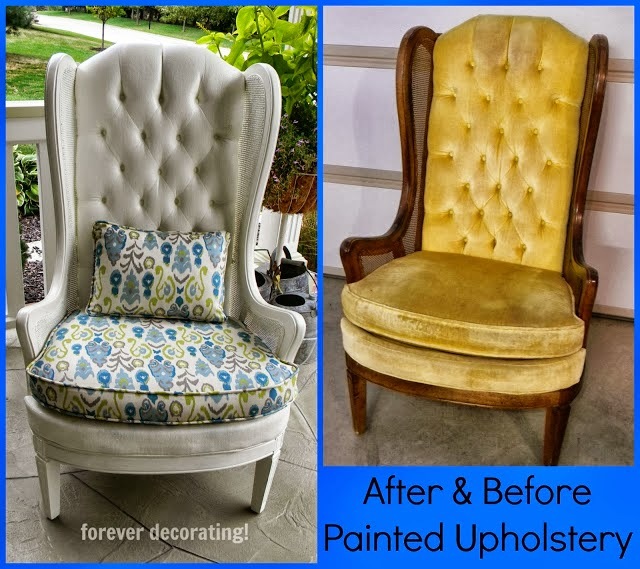 Terry from Forever Decorating gave this garage sale chair a beautiful update with a combination of new upholstery and painting the fabric. That's right, she painted the fabric! 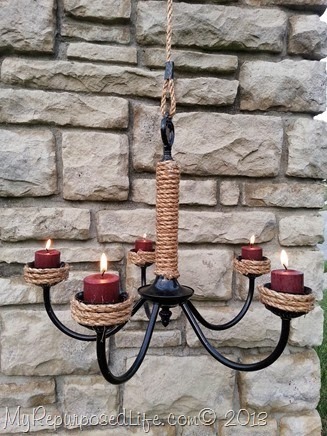 Gail from My Repurposed Life turned an old chandelier into a rustic rope-wrapped candelabra just perfect for hanging out on the porch! 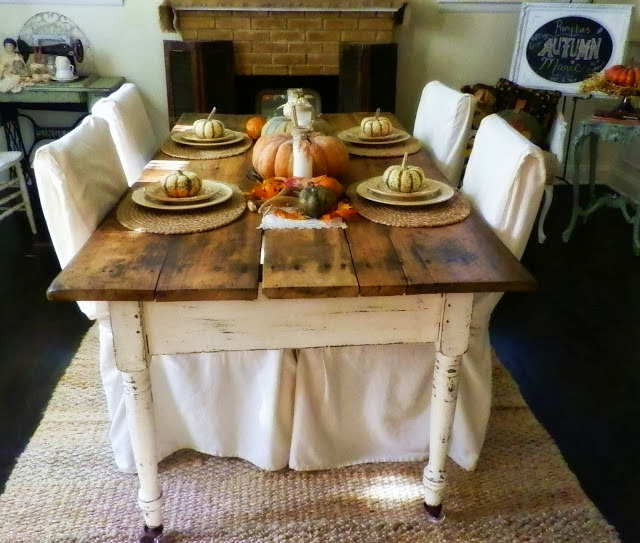 More rustic goodness from Amber of Junkaholics Unanimous. She picked up this farm table at a garage sale for just $10. After a little love, it was beautifully decorated for fall. Can't you just imagine Thanksgiving dinner here! 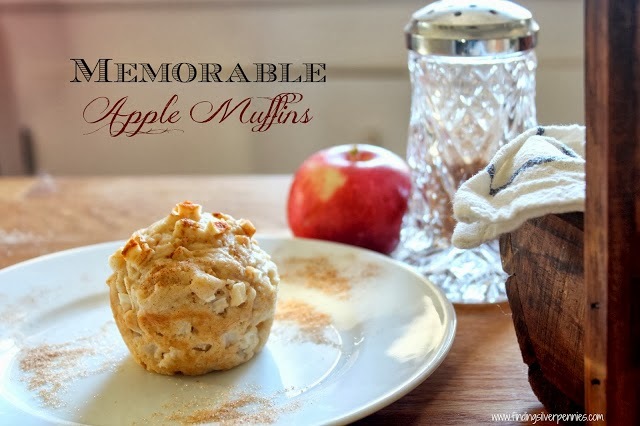 Danielle from Silver Pennies took her family apple picking and then came home and made some yummy apple muffins! 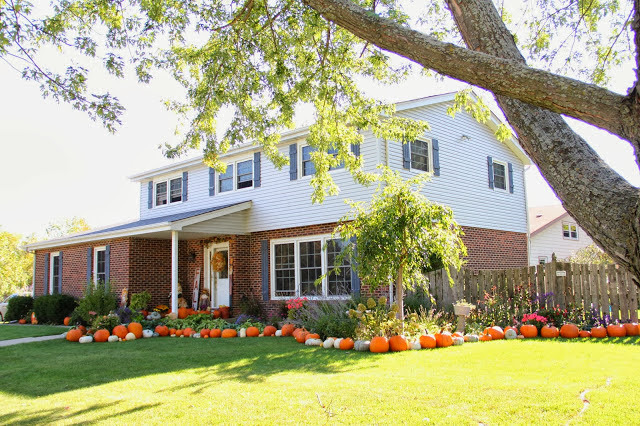 Pricilla took her family out for some serious pumpkin picking and they ended up with 95 pumpkins in their front yard - how much fun is that! 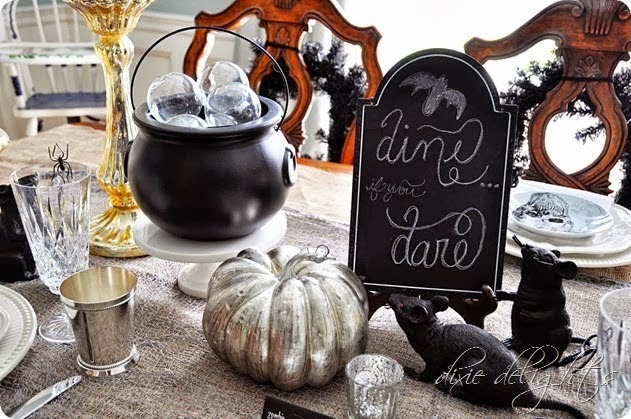 And if you're looking for a little haunted inspiration, you need to head on over to Dixie Delights for a whole house full of frights and delights - enter if you dare! 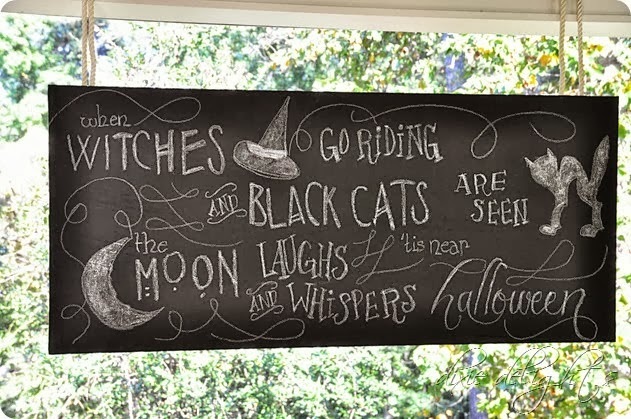 Amanda also shared all the details for this awesome chalkboard! Oh. My. Word! Even your "sneak peak" is pin worthy! 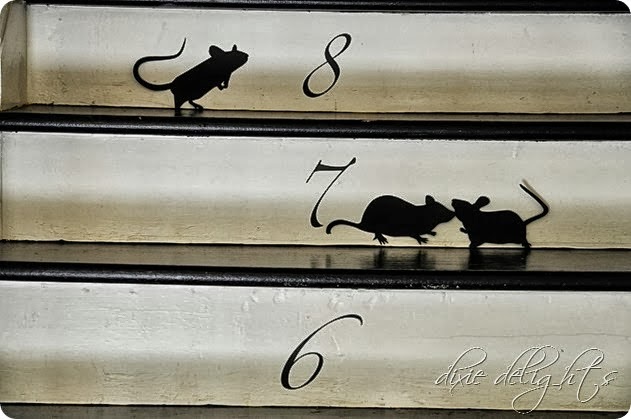 I hope you don't mind but I have pinned that image as "vintage baby shower decorations" --I adore it! I cannot wait to see the full post about it :) Again, wonderful and inspiring features and as always, thank you for hosting! Thanks for hosting, Sharon! 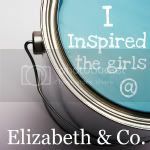 Looking forward to seeing all the inspiration this week. Thanks so much for featuring our pumpkin picking ! Hi Sharon...thank you for hosting! It's always fun to get new followers and find new blogs to follow. Some really awesome makeovers! Love that reupholstered chair. Can't wait to hear more about that baby you are referring too! Hi Sharon, loved (as always) the features this week. The farm table with the slipcovered chairs really caught my attention. Thanks for hosting. Have a great week. Wonderful features Sharon...still lovin' that awesome $10 farm table...what a deal!! Thanks for hosting and I hope you have a wonderful week. Super Feature this week Sharon! Love that updated chandy!Thank you so much for hosting!! such awesome features- holy moly that was a lot of pumpkins! Those are some beautiful features and a few more to check out. Thanks for hosting. Great features! 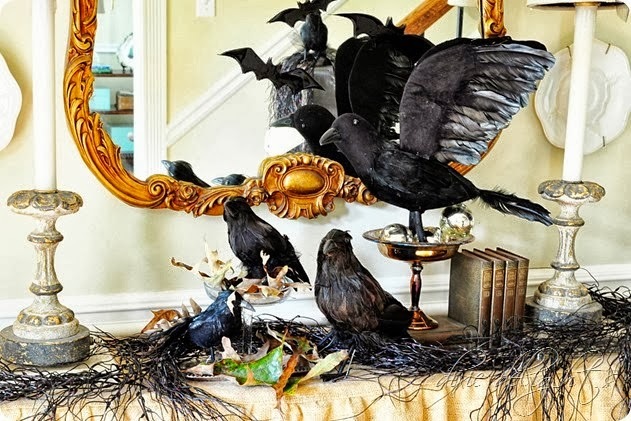 I'm loving all the Fall/Halloween decor inspiration right now. After our sale I need to kick it in gear!! forgot to say yay for the shower! can't wait to see more of that! thank you so much for featuring my rope candelabra! Oh thank you so much for the feature! Looking forward to this week's party too! Thank you so much for featuring my dresser! And thank you for hosting! I spotted some awesome posts to check out! Thanks for featuring my vaisselier. I feel honoured. What great inspiration! Thanks so much for hosting the fun! I'm new to the party, celebrating one month of my blog, and excited to participate! Would you be willing to make a smaller one for sale?